GLENFIELD VILLAS in Sydney are brand new, stylish and modern four bedroom homes conveniently located in the same street. There are 12 almost identical villas, perfectly suited for large bookings, each one able to accommodate up to 8 guests. Please note, few of the Villas may be able to accommodate up to 10 guests. 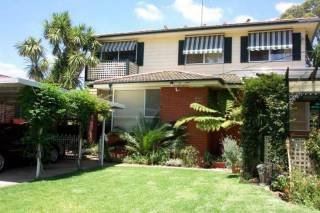 *** GREAT ACCOMMODATION SOLUTION FOR LARGE GROUPS TRAVELLING TOGETHER - TWELVE NEARLY IDENTICAL PROPERTIES AVAILABLE NEXT DOOR TO EACH OTHER - Located in suburb of Glenfield, 40km south-west of the Sydney Central Business District, these Villas have easy access to Sydney CBD and all of its attractions via M4 Western Parkway and M5 Freeway. Glenfield is located near Sydney Airport (26km)* Casula Shopping Centre (4.7km)* Restaurants & Cafes (3km) *Tree Valley Golf Course (1.7km) *Liverpool Train Station (25 minutes by bus) *Warwick Farm Race Course (9 km) & *Sydney CBD (40 minutes). The Villas provide the most economical option and a good base to see and explore Sydney and its surrounds, with countless attractions it offers. Each individual Villa has convenient features that include - bedding for up to 8 guests (10 adults maximum in some villas), 2 lounge rooms, two bathroom and an additional toilet, fully equipped laundry, car parking & secure outdoor entertainment area. The houses are quite spacious making them well suited for couples, families, larger groups and business stays. Each house offers central heating and a separate dual zone air-conditioner, security alarm system and can accommodate up to 8 guests with 6 beds – 2 Queen Beds and 4 Single beds. We are also children friendly and provide a portable baby cot and high chair at no additional cost. The large main bedroom includes an ensuite with separate shower/toilet while the main bathroom has a separate shower, bathtub & toilet and an additional separate toilet with basin. The large, modern kitchen is fully equipped with a stove, oven, grill, microwave, fridge/freezer, brand new dishwasher and modern cooking appliances. All plates, cutlery, crockery and glasses are provided. Cook your meals 3 times a day and entertain as if you were in your own home. Save time and money on dining out or paying high prices charged normally in hotels and restaurants. A fully equipped laundry includes modern washing machine and dryer, iron and an ironing board. Security and privacy are offered with a 1 car garage and off street parking, in a quiet family friendly neighbourhood. ***We have 12 other identical properties in the same street that you might want to book. *** We specialise in most affordable, group accommodation in Sydney and can easily accommodate larger groups of travellers. PLEASE NOTE: Last Minute Online Bookings & Same Day Arrivals: If your Booking Request is for the same day arrival, our cut -off time for accepting your Booking Reservation is 2pm on your arrival day. This is to ensure the property is ready for your arrival and check-in process is completed. Any Bookings Confirmed after 2pm may not be accepted and access to the property may not be granted. PERFECT ACCOMMODATION FOR FAMILY & CORPORATE BOOKINGS PLEASE NOTE : ALL VILLAS ARE INDIVIDUALLY FURNISHED AND PHOTOGRAPHS ARE PRESENTED AS A GUIDE ONLY. Special Events or Peak Season bookings - Cancellation made less than 90 days prior to arrival will forfeit the total monies paid. Any cancellations made after 1 week of booking will incur a minimum of 1 nights' accommodation cancellation fee to cover loss of booking income and administration.